A small girl stood nervously holding a ball behind the line, ready to serve. 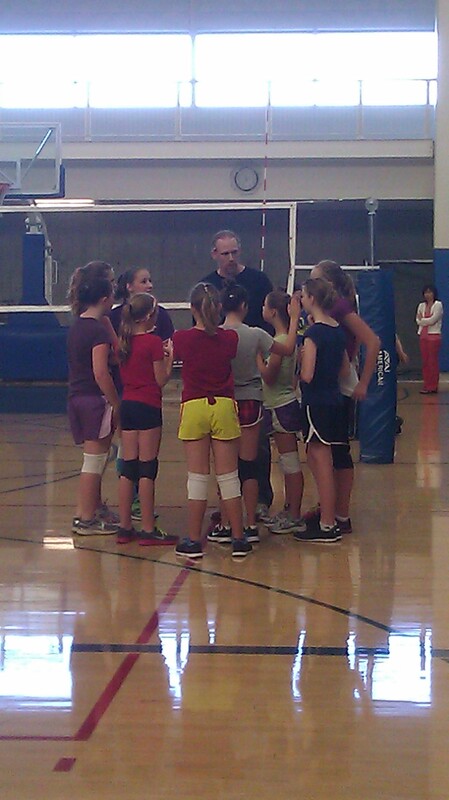 A coach and his players. Serving up a good message and a few good serves. Whether they went over the net or not. It was in the middle of a middle school volleyball game, one of many going on in a large athletic complex during a preseason jamboree. Although points were being tracked, they did not count toward the upcoming season’s standings. No clock ran and games were stopped when one team got to 25 points. In all other ways, it was a regular game. Parents were lined up in the bleachers at the end of the court. The opposing team waited for the serve. The coach signaled the umpire. He was substituting players. Several girls from the bench stood up and exchanged places with players on the court. The final substitution was to be for the girl about to serve. The coach and other player stepped back, nodded to the umpire, then to the girl behind the line. The girl stepped up, ready to serve. The umpire signaled. The girl eyed the ball for a moment and tossed it in the air. A smack. All eyes followed the ball as it flew toward the net. It fluttered, sputtered, and landed. Just short. Point to the other team. The girl looked at the ground, dejected. She looked up at her teammates, then at the coach. He smiled at her, and gave a big thumbs up. She returned a quick smile. In that small soon-to-be-forgotten moment, a substitute coach with little experience, gave a 13-year old girl a chance. Adolescence is an awkward time in every person’s life, when every action is magnified a hundred times, every failure is magnified a thousand times, and every time not being chosen is magnified a million times. He gave her a chance because he wanted to send a message that she could do it, and that there were people watching who cared about her, whether she did it or not. Every time we point out someone’s failings rather than how to get better, every time we skip over someone without explanation, we send a subliminal message that a person is inadequate – whether they are adolescent or adult. You can’t help someone get the ball over the net. They have to do that themselves. But you can always serve up a good message. Yesterday’s gift of time … Volunteered to coach our girls’ volleyball team for a preseason jambaree while the regular coach was traveling on business. This entry was posted in In the Neighborhood and tagged Adolescence, being positive, positive feedback, school volleyball, sending a message, sending a positive message, volleyball, volleyball game. Bookmark the permalink.